CNAP's mission is to improve resilience in California and Nevada by providing decision makers usable climate information through integrating cutting edge physical and social science. CNAP, California Nevada Applications Program, has a long history of providing cutting edge climate science to stakeholders in the region. Originally the program began as CAP in 1999, under the leadership of Dan Cayan and Kelly Redmond, and in 2011 the team expanded into Nevada and became CNAP. CNAP core priority areas have been and continue to be water resources, natural resources and coastal resources. Over the years CNAP has worked closely with California Energy Commission and has taken a leading role in the three completed and now 4th ongoing, California Climate Assessments. In addition the team has collaborated with California Department of Water Resources in several of their climate focused efforts. CNAP also has work closely with Fire agencies throughout the West to better understand fire behavior, institutional knowledge of fire fighters, and future projections of wildfire. Since expanding to Nevada, CNAP worked with Great Basin tribes to understand barriers to climate data and helped develop a resilience plan with Washoe County. More recently CNAP is working with Southern Nevada Water Authority, Science Climate Alliance – South Coast, and Bureau of Land Management (BLM) on climate related projects. Since the inception of the California Nevada Drought Early Warning System (CA/NV DEWS) CNAP has worked closely with the National Integrated Drought Information System (NIDIS) to coordinate communication and to research topics surrounding drought and water resources. CNAP program model highlights the outcomes, or what the type of products it produces including scientific journal articles, reports, stakeholder workshops, and mentoring early career scientists. The program model also describes the short-term, near-term and long-term goals for the program. Precipitation Tracking in CA and NV: This page shows the accumulated water year-to-date precipitation for various locations in California and Nevada. 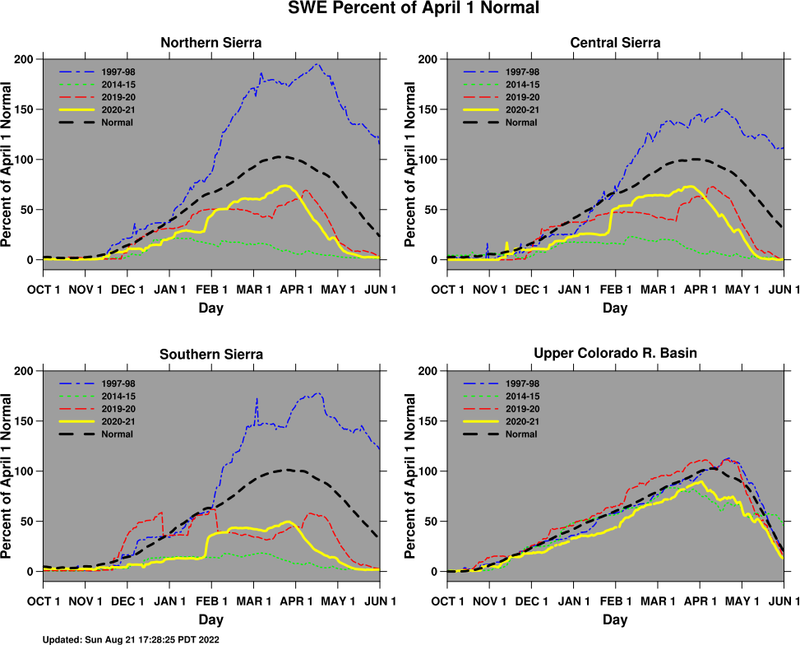 Daily Regional Snow Update: This graph shows Snow Water Equivalent as a percent value of the April 1 climate normal. Sea Level Tracking This page shows a figure with predicted and observed sea level heights for a recent period. Historical Precipitation Percentiles: This figure shows the time series of precipitation percentiles over the last 10 years as a function of timescale (vertical axis) for three California climate divisions. California Climate Tracker: Statewide and regional temperature and precipitation maps and time series graphics based. Climate Outcome Likelihood tool: Determine the likelihood of recovering a precipitation deficit or reaching a precipitation threshold during some future period based on historic station data. Great Basin Dashboard: Many sources of weather and climate information pertinent to the Great Basin in one convenient location. Nevada Climate Tracker: Statewide temperature and precipitation maps and time series graphics. Tahoeclim: Access to climatological and meteorological data and information for areas in and around the Lake Tahoe Basin, CA and NV. Westwide Drought Tracker: Statewide and regional maps and time series graphs of temperature, precipitation and drought indices based on the PRISM dataset. CNAP Climate Handouts: Timely fact sheets explaining recent weather and climate phenomena in the region (e.g. seasonal summaries, sub-seasonal to seasonal forecasting facts). CNAP Publications: Ongoing list of CNAP work published in peer-review journals. CNAP on Twitter: A Twitter account for CNAP sharing CNAP and related news about California and Nevada.